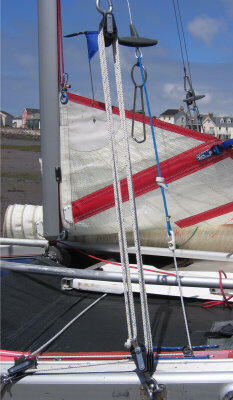 Jon Montgomery designed the roundhead sail in 2005 (covering Sail Nos: 500 - 520). It stays at 10sq m, with a straight leech, and batten-supported round head. Dolphin: Polyester Pentax Laminate, Radial construction. The basic structure of the boat is set up on a piece of ground chosen for flatness, allowing the two main beams and fore and aft cross beams to be quickly connected with two hand-tightened bolts at each corner. The trampoline is pulled along tracks on the inner face of the main beams, and tightened at the aft crossbeam when the frame is made up. 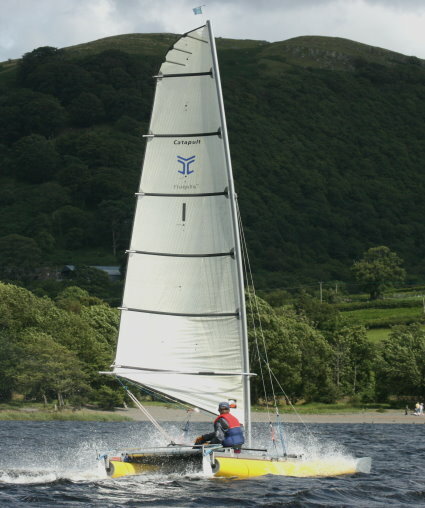 The fine entry forward (see also below) give Catapult a dramatic low profile on the water, and a fine sense for the helmsman of the boat's speed, close to the water. C The bow-boards are the solution to combining a very fine entry to the inflatable hulls with sufficient buoyancy in the bows. They slot snugly over the main beams as the final stage of pulling the deflated hulls along the tracks. D and left: Twin daggerboard foils are inserted into �outrigger� channels, through a window in the trampoline. 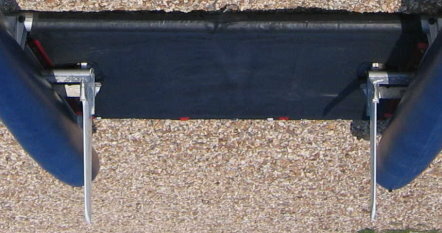 The foils are highly efficient, so wetted area and overall draft remain small (although there remains the option of raising the boards off-wind.) They have a �breakaway� ability if the boat grounds heavily, preventing damage.